Sicilians are deeply rooted in the cult of the Madonna. They possess a profound respect for motherhood, because as an agricultural society, their livelihoods have always depended on Mother Earth. (Keep in mind that Sicily’s hinterlands have supplied wheat to much of Europe for multiple millennia.) Therefore, it’s no surprise that images that pay homage to the mother goddess and promote respect for our own mothers appear sometimes where you might least expect. 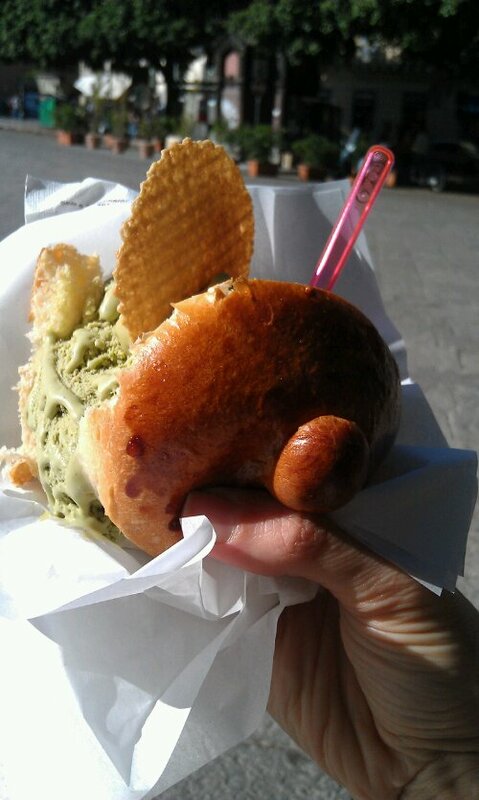 With this, I present to you one of the most wonderful culinary delights you will find in Sicily, and more specifically, Palermo: Il gelato con brioche. Il gelato con brioche is exactly what you would expect, a light, sweet, butter-infused roll (brioche) cut in half and stuffed with gelato. N.B., During the summertime, Sicilians are even known to eat one for breakfast! You are not mistaken if you thought the brioche presented above resembles a woman’s breast. As I learned from a waiter at a gelateria off of Palermo’s Piazza Castelnuovo, the brioche’s form is most certainly purposeful: Just like a newborn baby knows no time while he suckles his mother’s breast milk, of course you too would want to forget time while you nurse your favorite flavor of heavenly gelato… mine is pistachio. These personal reflections, observations and historical references are amazing: real insights into the experience of interacting with people, places, food, fashion, language and all the ingredients of a wonderful culture. Thank you.